West Coast Eagles performance analyst Amy Woods recently claimed the Claremont District Female Coach of the Year title at the 2017 District Awards of Excellence event held at Scarborough’s Rendezvous Hotel. 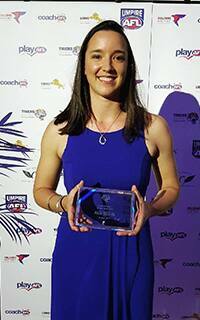 The first-year coach claimed the award following a successful year leading Marist’s junior girls team. Woods said she was surprised to edge experienced coaches Ashara Wills and Emily Johnston to win the award. “I went into the night thinking it was going to be great regardless of what happens because I know Ashara and Emily well, but I was genuinely shocked to win because they have both done state coaching and led teams for years, whereas this was only my second year of coaching,” Woods said. As proud as she was to snare the coveted honour, Woods said she got a real kick out of watching her team develop throughout the year. She said it was encouraging to see girls who knew next to nothing about the game grow into astute young footballers. “Most of the girls had never played before and came to the club with little to no footy knowledge,” Woods revealed. “We really had to work on their fundamental skills and learning how to play before they stepped foot on the field. “We saw massive improvement from all the girls throughout the season. It was so exciting when one of the girls who couldn’t take a mark at the start of the season was able to grab one midway through the year. Their individual development was encouraging and their game knowledge improved throughout the year. By the end of the season they were running into space and spreading like we practiced at training. The award-winning Woods hoped her involvement in junior women’s football proved to her young charges that there was a viable career path for women in the AFL. “The most rewarding elements of the role for me is having an impact on these young girls’ football journeys,” she said. “When I was a kid, I never got the chance because there wasn’t a pathway for young female footy tragics.